Today sees us celebrating our first birthday or anniversary at A Vintage Journey and we are celebrating in style. There are prizes galore, changes to our schedule and a new Creative Guide joining us - what more could we want? Well of course we would love you to join us too. 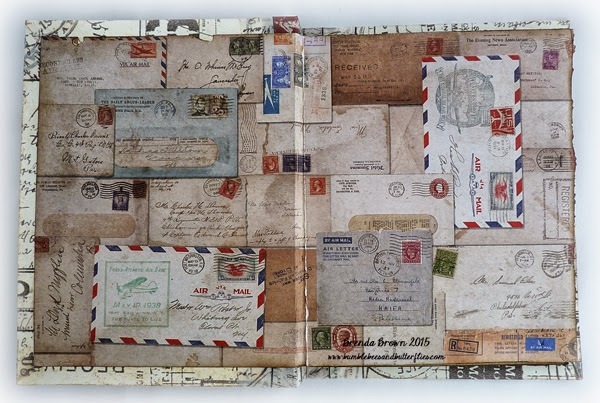 For my CG sample I have made a Correspondence book using Tim's new papers. 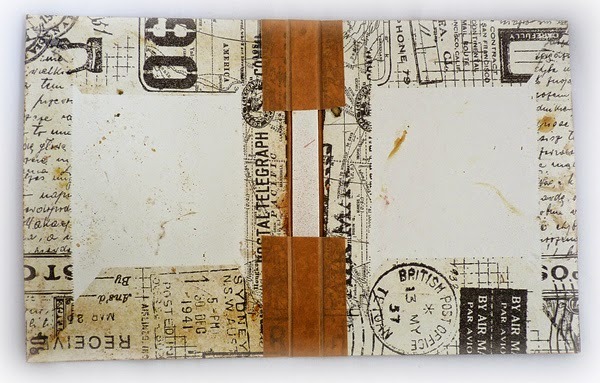 Now you may well have seen the book I posted on Sunday for CVC, that was made from the off-cuts of this one and yesterdays journal pages uses up the last scraps. 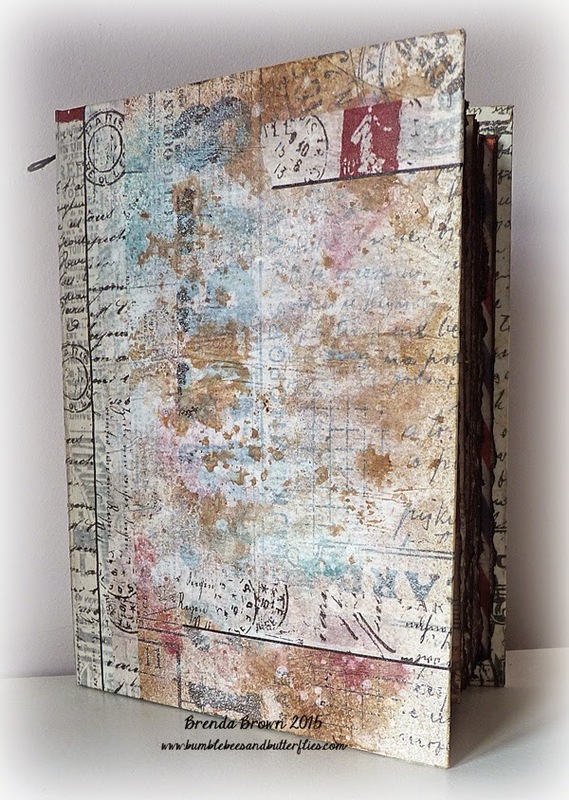 This is a hard bound, hard spined book which will be one of the types I am teaching at my next workshop on the 30th March (details in my sidebar). I'll show you some of the steps to preparing the boards. Cut boards from mountboard and cover with tissue wrap. Put under heavy weighted books/box for a few hours or overnight to dry and flatten. 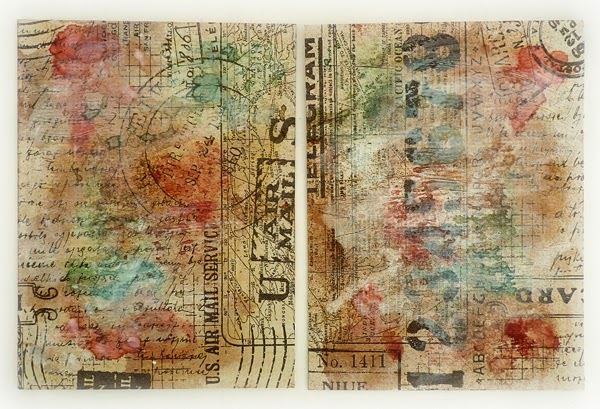 Daub with picket fence distress paint – heat dry. Dab and spritz fired brick distress stain and spray a little gathered twigs distress spray stain, spritz with water and push the two boards together to distribute the colours on both. Heat dry. Repeat with faded jeans distress spray stain and heat dry. The dampening and heat drying causes the boards to buckle a bit so put them back under heavy weights to flatten again. Use picket fence distress stain and some white linen dylusions spray to mist over the colours and tone them down and blend them together more. 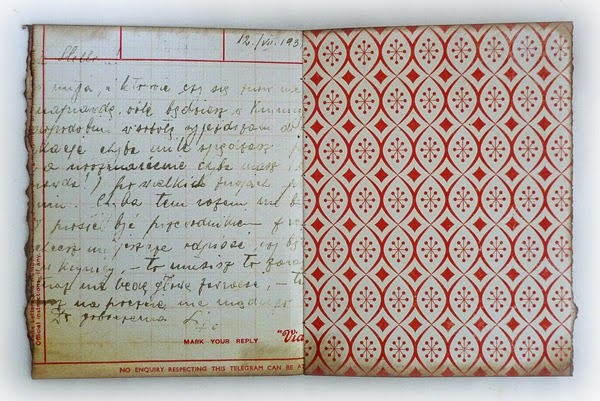 Adhere front and back end papers. Tear the front edges of the papers and ink them all round. On this occasion I used brown packing tape. Cover the spine with tissue tapes and note a small piece of elastic added to the top of the spine. ......... charms hanging down the spine. 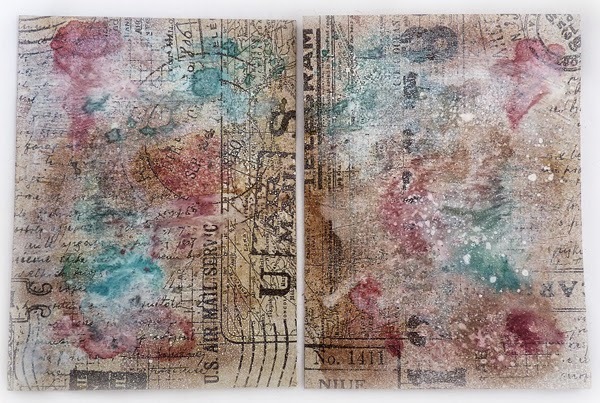 All the metal pieces were daubed with some antique linen distress paint and treasure copper rubbed over them. Do you know - I might just make this into a Birthday book so I can keep a reminder of when I need to send cards out each month. Mmmmm birthday, correspondence, celebrations, wow what a day. Because we are going monthly on our AVJ challenges there will be a monthly £20 voucher donated by our fabulous sponsors Country View Crafts and for today there are some very special birthday prizes to win as well. So please accept this invite to the party, we would love to see you there. Have a wonderful weekend and here's a quote for you. Brenda, my dear friend, I am also looking forward to seeing you really soon. I love your idea about using this wonderful book as a "Birthday Reminder" All the details and inky goodness are fabulous as always! Thrilled to be starting year #2 with AVJ. Big Hugs! What a wonderful book Brenda! 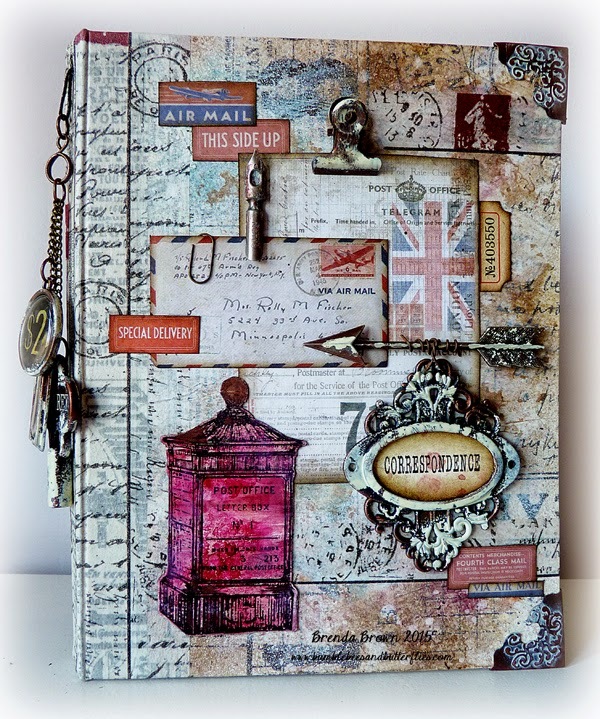 I can see that I will have to get me some of these correspondence papers - they are perfect for a project like this - love the charms hanging off your binding - the bits of metal - especially that frame and arrow! You always make your fabulous creations look so easy Brenda! 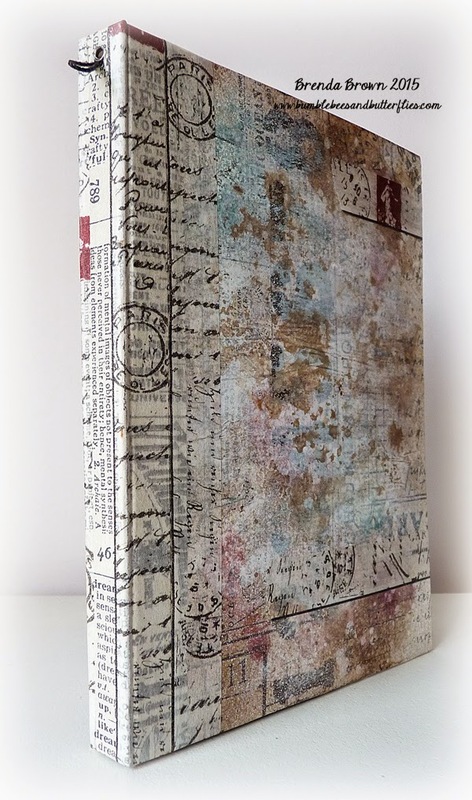 I love your Birthday Book, it is gorgeous with all the Correspondence papers and your wonderful embellishments - I so wish I lived nearer so that I could come to your class! Brenda, I think you know just how much I love books, this one is put together brilliantly! 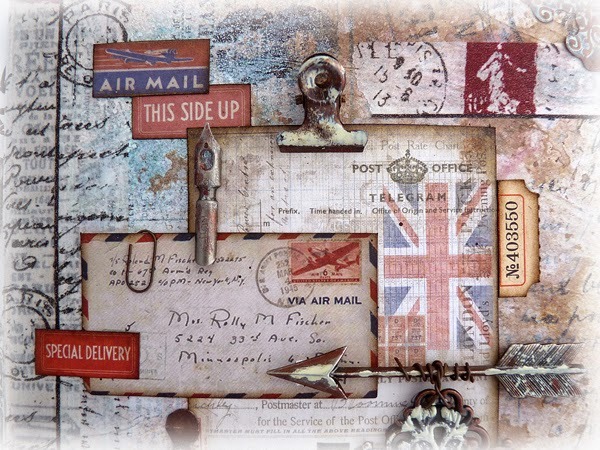 Every little corner of it looks just fantastic and I really adore how you have worked with those great papers. A fantastic project!! Last but not least, it's been great to work together and alongside you on AVJ!! Thank you sooo much for all that you do in the background too, I have just loved to work on this team! Brenda, this book is amazing! 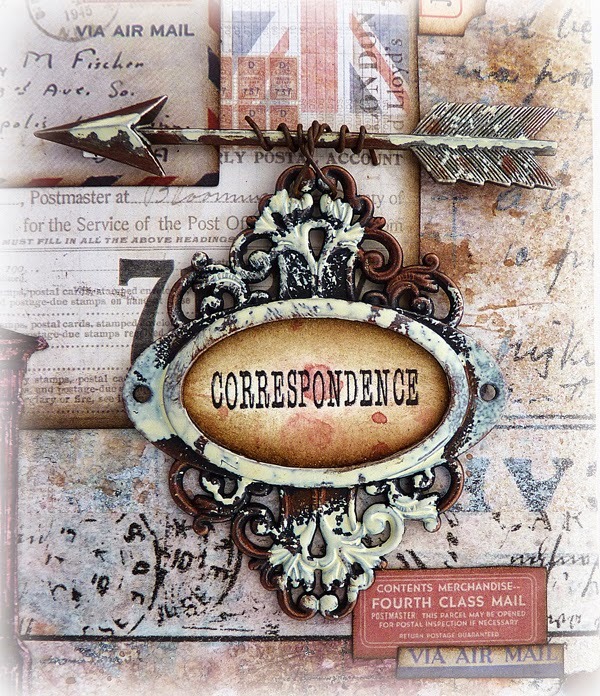 I love all the embellishments you used and love this Correspondence collection! Can't wait to get mine to play with! Brenda, This is a wonderful book full of great ideas and fantastic presentation. I love the entire thing. Lucky students to be able to take a class from you. Great way to celebrate our first year. Am I so pleased my Correspondence Papers arrived today after seeing this stunning book Brenda. Love the addition of your charms. So beautifully made. I'm so pleased you created A Vintage Journey a year ago. Its been great watching it grow in strength and I feel truly blessed being part of your team. Really awesome, Brenda...have a wonderful weekend! Brenda, I feel a long comment coming, but I'm so short on time. First I would like to thank you for all the work you do to make A vintage Journey come together, and on a personal note, for your help with my own blog. I also appreciate everyone of your supportive comments. Second, congrats on running such an inspiring, successful blog--it is truly my favorite! And last, but certainly not least this is one awesome book! Your backgrounds just leave me in awe! I love the new postal series and how you put it all together here. Pinning this for many more looks! Hugs! 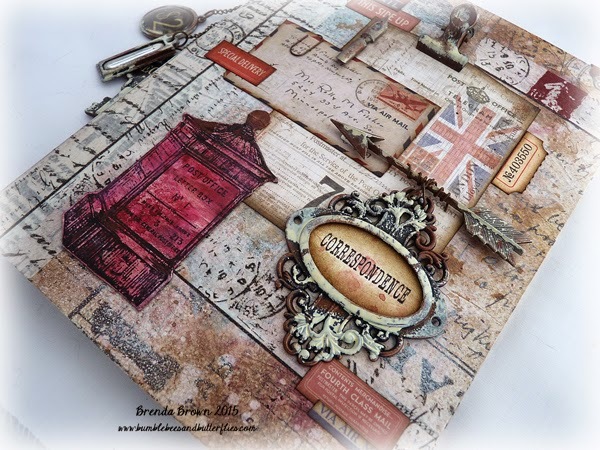 Gorgeous correspondence book Brenda and a fitting project to celebrate AVJ's 1st blogaversary! So thankful to have found your blog and A Vintage Journey, I have learned so much and know the journey has just begun. Wow this is AMAZING Brenda! The papers look fantastic and I just love how you created the wonderful background on the covers. I love the way you just say "flick a bit here" !!!! A stunning effect! and a wonderful finished piece. Thank you for all you do for us all at A Vintage Journey - the organisation, the support, the ideas …… It is a great honour to be part of this AVJ journey with you and the rest of the team. 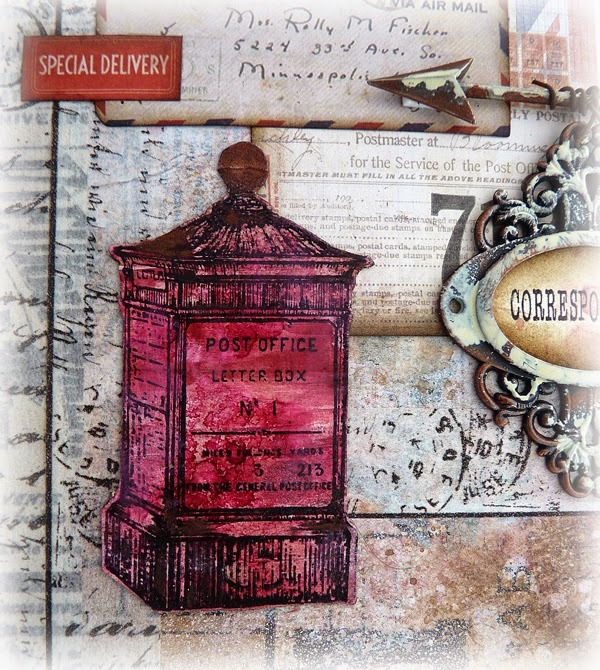 What a glorious showcase for all those fabulous Correspondence goodies, Brenda - the extra distressing you've added to the papers is so cool, and I love the altered metal pieces. Scrumptious! Sorry for my late visit - but so happy finally to be catching up with the birthday creations. This will be an excellent class! LOVE all the pages, and I am sure the techniques will be fabulous! Gorgeous! Brenda, that is absolutely gorgeous! What a wonderful use of Tim's new correspondence papers and all your ideaology bits and bobs complement it perfectly. How I wish I lived closer so I could take a class with you, you are so talented! A wonderful book to celebrate AVJ's first birthday and fitting that you will turn this lovely piece into your birthday reminder book!